Penumbra: Textured Shadow, Coloured Light, the debut London solo exhibition of acclaimed Bahraini artist Rashid Khalifa (b. 1952), brings together aluminium mesh wall works, steel grid mobiles and a colossal, walk-through maze. Held at Saatchi Gallery from 3 October - 19 November 2018, this immersive art exhibition curated by Tatiana Palinkasev and Eva McGaw invites you to explore the beauty of shadows and light cast through colourful architectural grids and geometric lattices. The show draws inspiration from the mashrabiya, an element of traditional Middle Eastern architecture. Typically a projecting oriel window enclosed with wood latticework found on the second storey of a building, the mashrabiya provides privacy, enabling occupants to observe the street life below without themselves being spotted. It also helps prevent the scorching desert sun from overheating homes in summer while allowing breeze and a limited amount of light in. Yet, compared with actual mashrabiyas, Khalifa’s re-imagined structures are more often than not, rather open, even social spaces, providing only partial privacy. Upon entering the first exhibition space, you encounter several three-tiered steel grid mobiles spread around the room. The colourful works, interspersed with small square coverings, immediately attract the viewer's gaze. As you walk around the mobiles, you are more than tempted to peek through their layered grids. On the one hand, each opening in the grid becomes a window in itself, and the overall effect is like looking through layers of mashrabiyas. The coverings, on the other hand, function like tiny shutters, blocking and further distorting the line of vision. It is equally impossible not to delight in the intricate, geometric shadows the sculptures cast onto the wood floor below. These beautiful greyish ‘drawings’ are as much part of the artwork as the steel material. Less successful however, are the mirrored square elements overhead, from where the mobiles hang as their purpose is not immediately obvious. You cannot see much of the mobiles reflected in the mirrors themselves and it is even trickier to see your own reflection in them. Perhaps they are meant to add to the ‘penumbral’ qualities of indeterminate space and partial illumination? 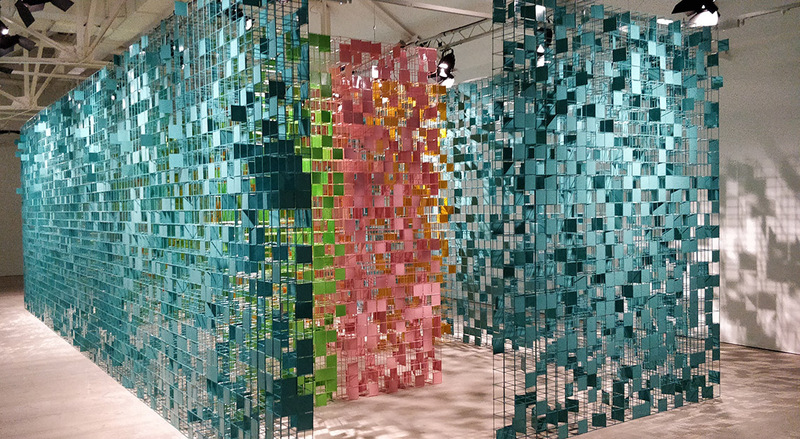 Additionally, the mobiles' soft, pastel tones - pink core, green centre and blue exterior - have the surprising effect of transforming what could be viewed as cold and potentially cage-like metal structures into warm spaces of sublime serenity. This proves that a seemingly inadequate material (steel) can actually provide a sense of calm and solace that an actual mashrabiya (wood) cannot. In dialogue with the steel mobiles are intricate convex aluminium sculptures that echo mashrabiyas more clearly than the other works on display. Khalifa refers to his new wall works as ‘parametric structures’ given that their patterns are based on complex mathematical geometric design, more common in architecture (ie Gaudi) but rarely seen in art. Four square pieces - one red, one blue, one green, and one white – as well two huge wavelike structures – one multicoloured and one white - adorn the walls. The red piece, with a diamond shape in the centre, and the long multicoloured wavelike structure stand out given their particularly dynamic optical illusions. The wall works feature an array of protrusions and patterns, injecting a sense of movement into the pieces. Likewise, they also have small openings, revealing the intimate space behind the surface, usually kept out of view. This allows for intricate shadows to be cast onto the walls. The question arises, is this like looking at a mashrabiya from the street outside? In the adjacent room, a monumental maze takes over. My initial reaction was that it was going to be very much like walking through one of Korean artist Do Ho Suh’s immersive installations where you can enter his translucent material interstitial spaces. This however, was an altogether different experience. Khalifa's installation may be just as Instagram-friendly as Suh’s colourful corridors but his maze is rather social, a space where conversations can be easily struck with complete strangers. It may be the work's bright colours, beautiful lighting and textured shadows, together with the grid and flap combination that lead to such a delightful, immersive experience or it may just be that you feel 'transported' to a different world altogether. Khalifa himself has said, 'I was inspired by winding narrow alleyways and traditional architecture. I would like the audience to experience the maze as a conceptual entity – a spiritual journey with no fixed destination.' And he is right, the exhibition does take you to a different place even if you don’t know where that is or even where you are going. Penumbra is indeed an uplifting space of discovery, bringing out childlike curiosity and a desire for further illumination. Rashid Khalifa, site-specific grid maze from the series Penumbra, 2018. Enamel on steels bars. W 200 x L 1193 x H230 cm.